Image caption The RSPB fears there is a "risk of birds getting stuck in or behind the netting and as a result dying"
Jeff Knott, regional director of RSPB, said: "We are really worried with the length of netting. There is a risk of birds getting stuck in or behind the netting and as a result dying." A council spokesman said the landscaping scheme was "designed to protect hundreds of homes in Bacton and Walcott, and the critical infrastructure of Bacton Gas Terminal". He added: "It has been subject to full environmental impact assessment, planning permission and marine licence applications. "We understand that the RSPB have concerns around the temporary netting element of the project and we are intending to meet with them and contractors on site to fully assess what those concerns are." 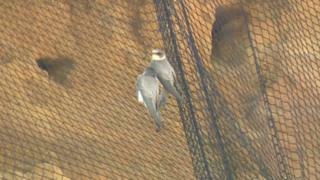 An RSPB spokesman said: "We are disappointed that the council have placed netting on the cliffs at Bacton to prevent sand martins from nesting. "In an effort to minimise the disturbance to nesting sand martins during the sandscaping project, we supported the contractor's recommendation for the council to use a fine mesh (which birds cannot get trapped in) on a small section of the cliff. "Based on the images we have seen published, our advice has not been followed and we will be reaching out to the council to offer further advice and support."